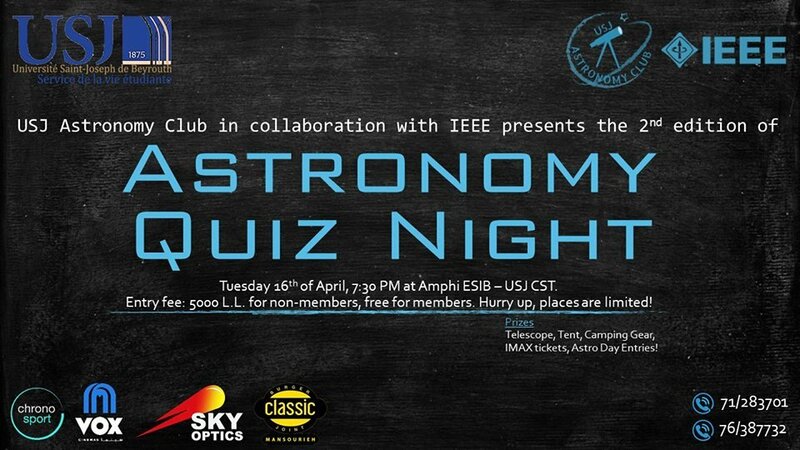 After a successful Quiz Night last year, the USJ Astronomy Club is preparing an even bigger one this year in collaboration with IEEE USJ Student Branch! Join us on the 16th at 7:30 pm in Amphi ESIB. Members are free to join, non-members must pay 5000 LL. Thanks to our sponsors: Chronosport, VOX Cinemas Lebanon, Sky Optics, and Classic Burger Joint Mansourieh!